1/ We isolate your lips and cover your gums with an isolation material which is called the liquid rubber dam in order to protect them during the treatment. 2/ We then apply the special laser whitening gel on your teeth and activate it with the laser energy for 2 minutes. After the activation, the gel gently breaks up the extrinsic stains on your teeth. 3/ We leave the gel on your teeth for 8 minutes, then rinse it off with water and suction. 4/ We repeat step 2 & 3 again for a second application. The treatment is finished. You now have a brighter and whiter smile. 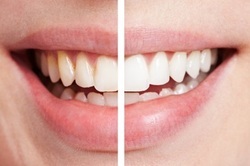 Contact our office today at (206) 722-6706 to schedule an appointment for EPIC Laser Teeth Whitening!